Whether you’re a snow sports pro or it’s your first time on the slopes, discover our expert advice to get the most out of your ski trip for your mind, body and soul. Snow sports are great fun, which is why people return to the slopes each year, but they're also hard work. Whether you're skiing or snowboarding, your thighs, hips and core will be challenged, so it’s a good idea to start working out to build up strength before your trip. Building strength can also help to prevent injury, so we recommend starting training around six weeks before your trip. As well as building up your physical strength with exercise, it’s a good idea to eat well before and during your trip. Pushing your limits in unusually cold temperatures requires high-performance foods to replenish calories and other vital nutrients. Eating for strength is particularly important while skiing: building new muscle requires the body to synthesise new cells and grow tissue. This is only possible with extra calories, in the form of protein and carbohydrates, in addition to those required for general function. When you're preparing for a ski trip, you're probably more concerned about the possibility of injury from a fall, but on the slopes your skin is also vulnerable to the elements. 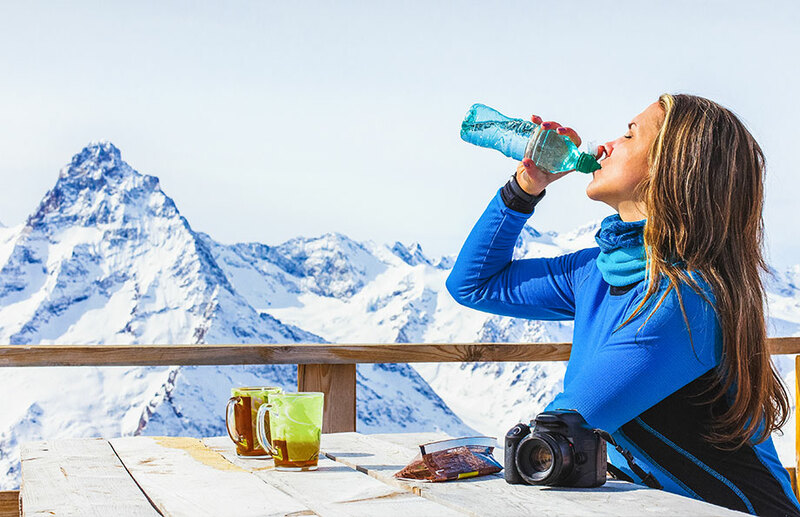 Windburn, frostbite, sunburn and, even the dehydrating effects of central heating in your chalet can all irritate skin. ✓ Get plenty of water - Activity can leave you dehydrated from breathing hard and sweating. ✓ Minimise alcohol intake - Alcohol dehydrates the body and, in the skin, this shows up as dryness. ✓ Avoid hot showers and baths - Hot water can strip natural oils from your skin. ✓ Ask for a humidifier - Counter-act the drying effects of alpine air and central heating with a humidifier in your chalet. ✓ Embrace the opportunity to sleep well and rebalance your body clock. By making mindful, sensible decisions you can reduce your chance of injury. If you’ve sustained what you think is a soft tissue injury (i.e. not a broken bone) it’s advisable to rest, ice, compress and elevate (RICE) the injured limb. If you suspect a break or a head injury, seek urgent medical assistance. 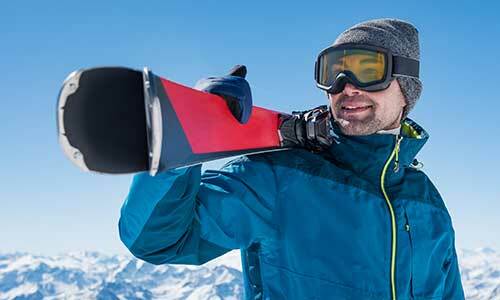 Do you know the most common ski and snowboarding injuries? For snowboarding - It's arms, as people reach out to protect themselves when they skid or fall. For skiing - It's knees, caused by ligaments tears when falling at force. Rest – If you’ve injured your leg, keep it elevated. If it’s your arm, try not to use it until it starts to feel better. This could take 72 hours, but it’s better than making the injury worse. Ice – The use of ice can have a great effect on pain. There’s plenty of ice around on the slopes, but create an ice pack rather than placing ice directly onto your skin, which can burn. Compress – Wrapping your injured area with an elastic bandage can help decrease swelling. Be careful not to wrap it too tightly - this can cut off circulation to the area. Elevate – Elevate the affected area in line with or above your heart level. This will also help to reduce the swelling. Bodyparts further from the trunk will require longer. If you do injure yourself on the slopes and find it's not getting any better, physiotherapy can help to improve pain in the short term and prevent long-term problems.